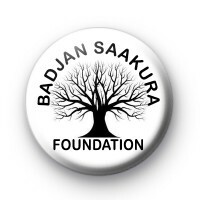 Custom Badjaan Saakura Foundation Badge in white with a black tree logo and black text for Pa Assan. 25mm badge hand made in our UK workshop. Please get in touch if you would like your own custom badges designing for your charity or company.